If you want your business to excel in the digital market then, you must have a website. In such cases, you have to register your website through a domain name. Domain name is nothing but the exclusive address of your website through which the target audience will connect with you. You can buy a domain name from a domain registrar. The Domain registrars will provide you the available domain name for your site. There are several things you need to know about the Domain registration. You can have a concise look at the section below in order to know them. Once you have your own website, now you might need to register it to domain registration. Before you do that there is some information you should know about the domain registration. At the very beginning of the process of domain registration, you should choose the domain name from the domain registrar. While choosing the domain name, you should take care of few things. You should choose a domain that would be easy to type. Always try to keep it short and avoid the numbers and hyphens in the domain name. If you want your business to be available by a simple search, then try to use keywords in it. Your domain name should be catchy and memorable. You must research the domain name you are choosing if the domain is already trademarked. At last, you need to use a proper domain name extensions like .com, .in, .net, .info, .me, etc. So once you make an interactive website that takes minimum time tio load, now you are all set to upload it to the domain you chose. You have already built and uploaded your site to the domain registrar. Now you can access it globally over the internet. Once you have your business online then, you should have a professional email address. If a customer has a query then, he/she can send it to your professional email address. There are a few facts that you should know about the process to set up a professional email address. You should not use the free email services as your professional website because that doesn’t look good. So always try to use a professional email address from the domain you purchased. It should have the name of your brand to attract customers. To deal with other business entities, you must have your professional email address. The security of the email should be in the optimum condition. You always need to use a verified domain name if you want your emails to go directly to the inboxes, not the spam. So, always check the spam quality of your email. All the domain registrars in the market provide you with other services as well. You can have email accounts, domain forwarding mechanism, easy to use control panel, DNS management, etc. In this section, you are going to know about the different services that you can avail from the domain registrars. If you have purchased a domain from the domain registrar then, you can avail their email service. Once you have your own domain for your site, you need to visit the website of the domain registrar. Then, you should create an email account from your domain. The email account would have the same extension as your website. Different domain registrars provide you with some storage capacity. In case you want to increase the storage limit you have to purchase it with extra bucks. When you click on some link of a website, it may redirect you to another webpage. The domain forwarding is nothing but the redirection process that is mandated by the domain itself. When the domain forwards you to another website, you can’t see the current URL of the page. In the address bar of the browser, you would find the new domain name. The domain forwarding procedure allows the webpage to redirect without using any HTML or script file. All the domain registrars provide you with their control panel. Using the control panel, you can maintain your site. If you want to change or update some content of your site then, you can do so by this control panel. You can even add more pages to your site using the control panel. The use of the control panel is very easy. This control panel consists of different tags to edit text and media uploading options. As you already have a domain name for your website now, you have to manage it. The system that manages the domain names is called the DNS Management. Usually, we use the DNS management software to deploy the DNS data to the multiple servers. We use it to reduce different facts like human error while editing complex DNS data or the effort to edit them. 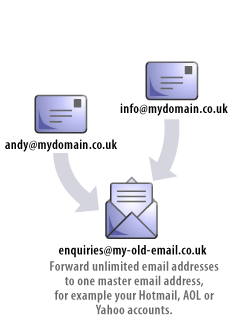 Sometimes, you might not have the flexibility to forward your email with the domain registrar. Some domain registrars offer you an amount of free email forwarding, but not all of them. You need to buy the service in order to avail it with your domain. You can do that by going to the domain registrar’s website and then buy the suitable plan for you. Hence, that is all you want to know about the domain registration of your site.